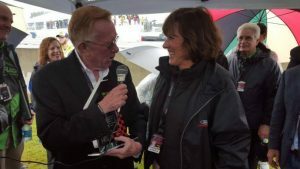 Don Panoz, chairman of DeltaWing Technology Group and long recognized in motorsports as the founder of the Panoz Motor Sport Group, the American Le Mans Series (ALMS), and the Women’s Global GT Series, has been named the 2015 recipient of the Women in the Winner’s Circle Leadership Award, presented by motorsports pioneer Lyn St. James and the Women’s Sports Foundation. Panoz is recognized for his many contributions and support of women in automotive and motorsports. St. James created the Women in the Winner’s Circle Leadership Award in honor of Paul Newman, a legend in entertainment, racing and philanthropy. In 2008 his Newman’s Own Foundation provided the initial funding that enabled St. James – former president of the Women’s Sports Foundation – to establish the Project Podium Scholarship for women in racing. In 1999 Panoz founded the Women’s Global GT Series, a road racing series open to professional female drivers piloting identicall y prepared 400-horsepower Panoz Esperante GT race cars. Far from a powder-puff derby, the Women’s Global GT Series featured professional racers from around the world. The series merged with the Panoz GT Series, perhaps a victim of simply being ahead of its time. Panoz, a successful entrepreneur who ardently believes success lies in not following the status quo, continues to not see the world along gender lines. Since 2013 Katherine Legge has been a constant on the Claro/Tracfone DeltaWing Racing Cars team piloting the radically innovative and highly efficient DeltaWing Roadster before moving to the DeltaWing DWC-13 Coupe race car in 2013. Legge remains the first and only woman to lead an ALMS race, doing so in the DeltaWing at Road America in 2013. Her tie to Panoz dates back to her days racing in the 2007-‘08 Champ Car World Series that featured Panoz DP01 Cosworth V8-powered open-wheel race cars. The Claro/Tracfone DeltaWing Racing Cars DWC-13 Coupe competes in the IMSA-sanctioned 2015 TUDOR United SportsCar Championship and operates on the principle of greatly reduced overall mass. It is about half of the weight, has half the drag, needs roughly half the horsepower, and consumes half of the fuel of other race cars in its class, yet deliver the same performance. Panoz is bringing this technology to street-legal vehicles. Past Women in the Winner’s Circle Leadership Award recipients include Dan Davis, former director of Ford Racing; Tom Binford, chief steward of the Indianapolis 500 from 1974 to 1995; Mike Helton, president of NASCAR; the Fédération Internationale de l’Automobile (FIA) for establishing the FIA Women & Motor Sport Commission; the National Hot Rod Association (NHRA) for its long history of supporting women in motorsports; and Lisa Noble, president of the Sports Car Club of America (SCCA). Lyn’s (www.lynstjames.com) passion, focus and determination made her a fierce competitor on the track where she achieved many firsts in racing. That same passion has made her an advocate for the next generation of racers and an incredible motivational speaker. As former President of the Women’s Sports Foundation, she was able to establish the Women’s Sport Foundation Project Podium Scholarship for women in racing and the Leadership Award to recognize outstanding leadership in the racing industry. Founded in 1974 by tennis legend Billie Jean King, the Women’s Sports Foundation (www.womensportsfoundation.com) is dedicated to advancing the lives of girls and women through sports and physical activity. Project Podium teamed up with the Women’s Sports Foundation in 2013 under the leadership of past president, Lyn St. James. The annual Race Track Business Conference (www.racetrackbusinessconference.com) hosted by the National Speedway Directory provides a platform for industry leaders to collaborate, analyze, and conceptualize around the business of motorsports. Shared insights from all forms of racing creates dialogue and interaction in a unique intellectual environment.